In the Martin & Sylvia story "Getting Their Tree", Daddy has the idea of taking a horse-drawn wagon into the woods of a Christmas tree farm to find their holiday tree. There, they find not only a field of Christmas trees, but also a warm cabin and some delicious hot chocolate. Since we’ve already covered regular hot chocolate in this space, this week I give you its even warmer, spicier cousin—Mexican hot chocolate. The two recipes are similar, except that Mexican hot chocolate begins with special Mexican chocolate. Sold in hexagonal cakes, Mexican chocolate contains bits of granulated sugar and sometimes a pinch of cinnamon. I was able to find a recommended brand—Abuelita—in the international section of my regular grocery store. 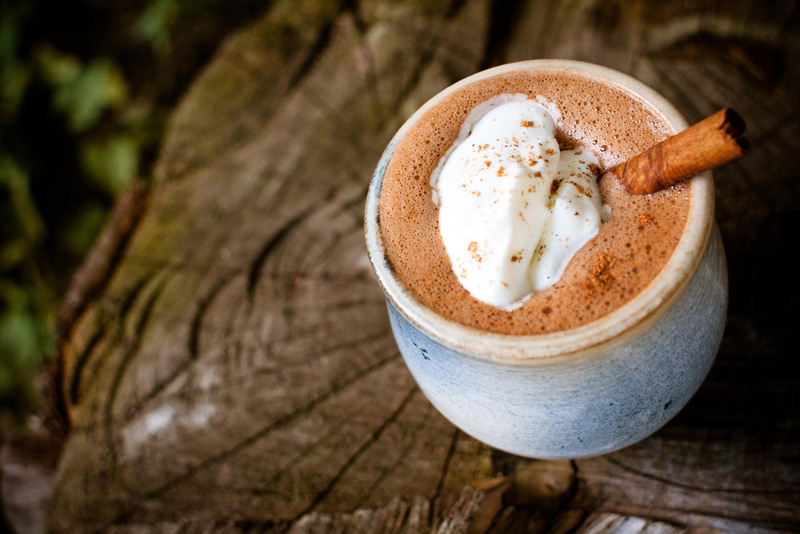 Mexican hot chocolate also ends with a kick—a pinch of cayenne pepper and other warming spices. The pepper is optional, but I recommend trying it at least once as it really adds a layer of warmth to the drink. The resulting cocoa is sweet without being cloying, and tastes like a special holiday version of regular hot chocolate. Give it a try for your next sledding party or cozy night in. Put the milk into a small pot to simmer. Chop the chocolate and add it to the milk, stirring gently until it melts. Add a small pinch of each of the spices, then whisk the hot chocolate mixture furiously to make it nice and frothy. Pour into mugs and top with a generous dollop of whipped cream. Add a cinnamon stick and an extra sprinkle of nutmeg for garnish if you wish.